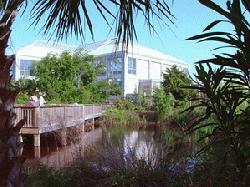 The Aquarium includes indoor and outdoor exhibits, auditorium, classrooms, meeting rooms, and a gift shop. In addition, there are daily programs featuring live animals, marine life videos and special activities. Most visitors can tour the aquarium in about an two hours. However, if you plan to participate in aquarium programs, search for relics in the Fossil Hunt, or visit the gift shop, allow more time. 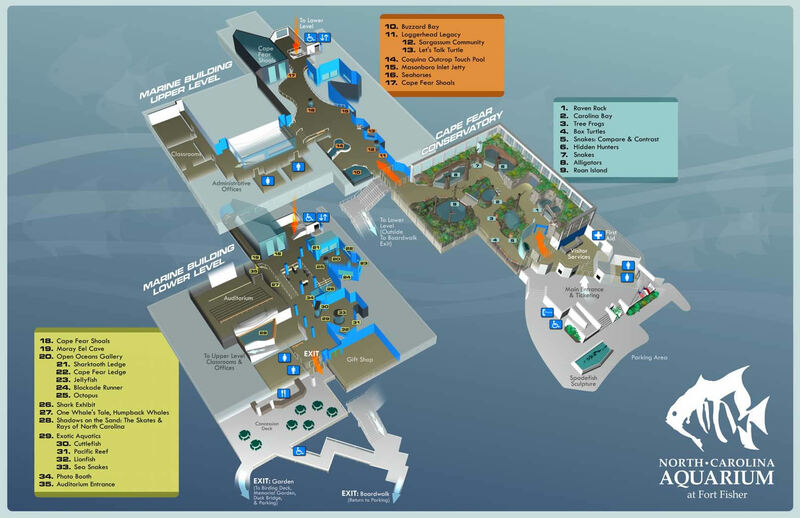 All entrances, exits, restrooms and exhibits are wheelchair accessible. For more information please contact the Aquarium at 910-458-8257, or toll free at 1-866-301-3476. The North Carolina Aquarium at Fort Fisher is located on US 421 approximately 15 miles south of Wilmington, just beyond Kure Beach. From Southport, take the Southport-Fort Fisher Ferry. For ferry schedule, call 910-457-6942 or Toll Free at 1-800-BYFERRY. Special Summer hours: 9 a.m. - 9 p.m. every Thursday in July.